UDINE, Italy (AP) — It’s getting to the point where other clubs are wondering why they even bother competing against Juventus. Having already won seven straight Italian league titles, Juventus has reached another level this season with the arrival of Cristiano Ronaldo. Earlier in the season, retired Roma captain-turned-club officer Francesco Totti said that the best his squad could hope for was second place. Two more wins and Juventus will match the Serie A record of 10 straight at the start of the season set by Roma in 2013-14. 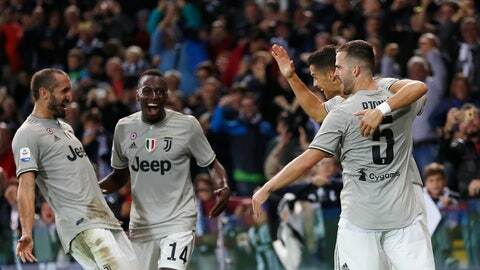 Juventus beat second-place Napoli 3-1 last week and has scored five goals and conceded none while winning its opening two matches in the Champions League. While Ronaldo and Mario Mandzukic lead Juventus with four goals apiece in the league, other players are contributing in unexpected ways. Fullback Joao Cancelo has dribbled past opponents 17 times this season to lead the league in that category. Midfielder Rodrigo Betancur’s opener against Udinese made him Juve’s ninth different scorer this season. Inter and AC Milan enter the city derby on hot streaks. Inter has won six straight between Serie A and the Champions League while Milan is on an eight-match unbeaten run between Serie A and the Europa League. Mauro Icardi’s two goals in a 2-1 win at Spal on Sunday gave him 103 for his Serie A career with Inter, matching Nerazzurri great Christian Vieri for seventh all-time at the club. Milan center forward Gonzalo Higuain has scored three goals in his last two matches, including two in a 3-1 win over Chievo Verona on Sunday. The Milan derby on Oct. 21 is the highlight of the next Serie A round after the international break. Former Italy international Antonio Cassano could be making a comeback with Virtus Entella. The 36-year-old Cassano last played for Sampdoria in May 2016. He signed with Hellas Verona before last season but abandoned the club after two weeks, saying he missed his family. Entella is still waiting to learn which division it will play in this season. The club maintains it should be re-admitted to Serie B after Cesena was relegated because of false accounting. Entella has played only one match in Serie C while awaiting the outcome of the legal battle.